It’s no secret that I’m into fashion. In fact, I’ve been known to say (half-jokingly) that it’s my hobby. We can’t all be crafty, can we? When I discovered Le Tote, a fashion rental subscription box, I quickly fell in love with the concept and the price point for what you get. I get asked about the service a lot (most notably, if it’s like Stitch Fix), so I want to lay it out there to clear up the confusion and maybe persuade you to give it a try! Simply put: Le Tote is fashion rental, where you get to borrow a box of garments and accessories styled by the Le Tote team. The items are selected based on the preferences you set when you create a profile (and update as often as you like). But the big difference is that you get to review your box before it’s shipped, swapping any item you don’t want to receive. Stich Fix is a styled box that you have to buy if you want to wear and you don’t get to review before it ships, so you may not even like anything that you receive. 1. I was spending too much on fast-fashion. I would peruse the Target clearance rack or pop into Marshalls whenever I had a party or event to attend and “buy something cheap” that still ended up costing me $40-50 a month (give or take). Now, I rarely buy something new because I get a fresh tote every week and I always have something “new” to wear! Also, they offer maternity options as well, so this would be a great way to stay fashionable and on-budget during a pregnancy! 2. I love to follow trends. But it doesn’t make sense to buy as many pieces as I would like to ”try” considering I don’t really have all that exciting of a social life (newly single mom here, friends). 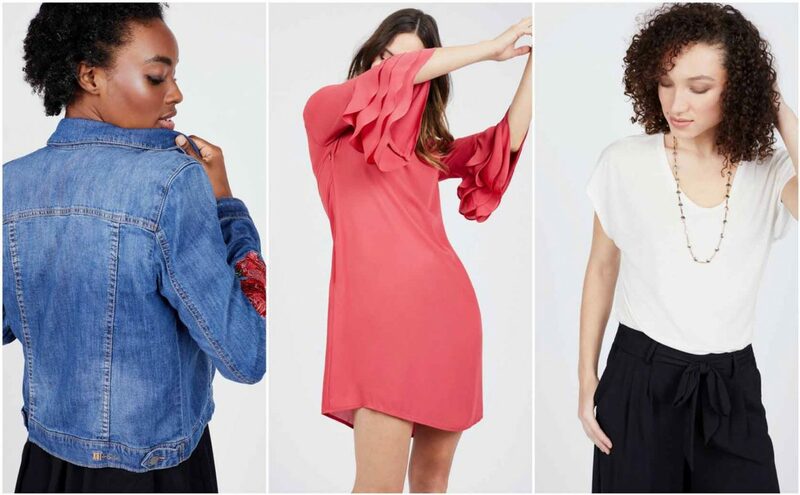 With Le Tote, I get to try what’s hip and trendy, and I’ve also found that since I’m not buying the pieces, I’m willing to try styles I would avoid even considering for the dressing room since I can return it after just one wear. In the time I’ve used Le Tote, I’ve maybe chosen five pieces I didn’t end up liking, but I have definitely chosen dozens I thought I might not like and ended up really enjoying them! I get to stay on-trend with less risk and cost. I also find myself doing more pattern-mixing because again, I’m willing to try a print for a week that I likely wouldn’t buy and sometimes pair it with something I already own that makes for a bold look. But, if you’re looking to dress for work without spending a lot, there are plenty of classic professional pieces to choose from, too! Here are 5 reasons I love Le Tote, an affordable fashion rental subscription box! 3. My wardrobe stands out now. Before starting with Le Tote, most of my clothes came from Target, you know, where all of my friends shop too! Now don’t get me wrong, I love Target (it’s our happy place, right!? ), but the clothes I get from my box are markedly higher-end than I was used to. The brands are nicer and the fabrics are quality. I had heard it said that higher-end pieces fit and feel nicer, but I didn’t really believe it. But, I can attest…the Vince Camuto, Free People, BCBG, and other brands I now frequently choose really do make a difference. And rarely do I find myself in the same dress as my bestie now. Hey, it’s fun to stand out! Plus, when people ask what you’re wearing, you can refer them to join Le Tote and you get purchase credit that you can use to keep items in your tote (that, of course, are discounted when you buy!). Oh, they often have killer sales too, just recently they had up to 90% off for the season change and I got four pieces (including a BCBG jumpsuit and a “leather” jacket) for under $100. 4. I get more excited about the pieces I do own, too. As much as I love opening my new box every week (yes, I work the system to receive a new one every Friday to wear over the weekend, returning my tote first thing Monday to the post office so my next tote gets shipped ASAP), when I’m between totes I find myself more interested in “my clothes.” My pieces get less wear, so they feel new too! And, sometimes that top or dress you feel like is overdone paired with new-to-you jeans or a fun bomber jacket you’d never buy but rented all-of-a-sudden feels new too! 5. Last but certainly not least—two words: no laundry. That’s right; you return your pieces unlaundered in a pre-paid envelope. Easy peasy, thank you very much. So those are a few of the reasons I love Le Tote. Here’s a video of me opening a recent box so you can see how it works! Here’s me in the dress I mentioned in the video! If you’d like to try Le Tote, I’d love it if you used my code here for a free box that you can keep for two weeks! I’m currently in a contest to refer the most people, and if I win, I get to fly out to San Francisco to be in a Le Tote photo shoot. C’mon, how awesome would that be? The cheapest box will cost you $59/a month which includes three clothing pieces and two accessories. They have a maternity box for $69 and other boxes too. You can cancel any time or even place your account on hold for a week, or two or even a month. You can also add additional pieces to any box for $9.99, so if you’re going on vacay, grab a few extra pieces instead of buying clothes! I’ll be headed to Denver soon (way different than SW Florida), so I’ll be adding a jacket for my trip for sure! You can always start with a free box that you can keep for up to two weeks here! I have found that Le Tote has great customer service! They’re very responsive and friendly. I just send an email to hi@letote.com, and they get back to me right away. I’ve had them delay my billing when I had a problem without question! Isn’t it weird to be “renting” clothes that others have worn? I thought that at first too, but I haven’t ever gotten a piece that seemed “worn.” In fact, one of my friends who also uses the service and I joke when seeing each other that we’ll have to add that item to our “closet” (in the app). But, if you really don’t love that idea, they do have Le Tote Select that is more like the Stich Fix route. So, fellow fashionistas, or wary wearer, give Le Tote a try. You might love it. And if not, you might just help me get to San Fran. So, fellow fashionistas, or wary wearer, give Le Tote a try. You just might love it. This article’s feature image is from Le Tote’s blog—a great resource for making the most of your totes! You’ll also like Hot Trends Fresh from the Runway for 2018, My Favorite Time-Saving Hack: a Wardrobe Capsule (For Comfort! ), Is Social Media Making You Overspend on Your Closet?, How to Get Free Mac Lipstick or Shadow, and Why is Premium Denim So Pricey? 4 Things You Need to Know!